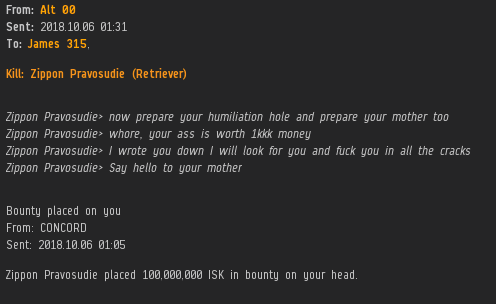 Spend 100 million isk on a bounty instead of 10 million on a permit? 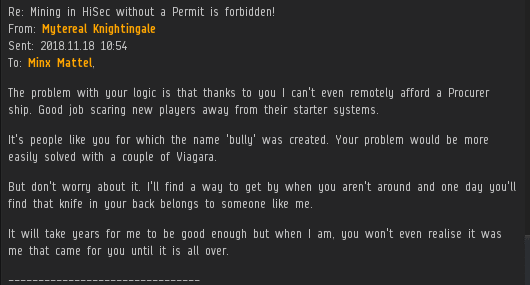 That's miner logic for you--and another edition of the Highsec Miner Grab Bag! "Years"? I guess that means the New Order retained another subscriber--and for the long-term, at that. I never did call him. 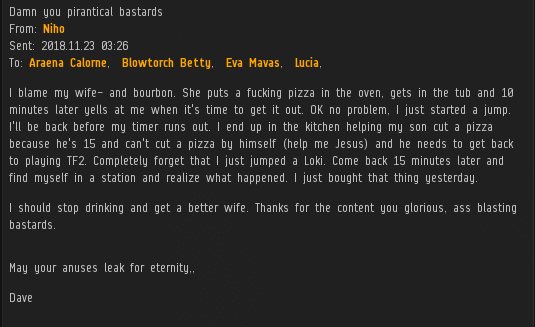 I find EVEmail more convenient, actually. Carebears, say what you will about our Agents, but they're decisive. And they really do want to gank you. Trouble Shaile violated the Code and lost everything he had. Nevertheless, it was Trouble who had a lesson for our Agent. The mighty CODE. 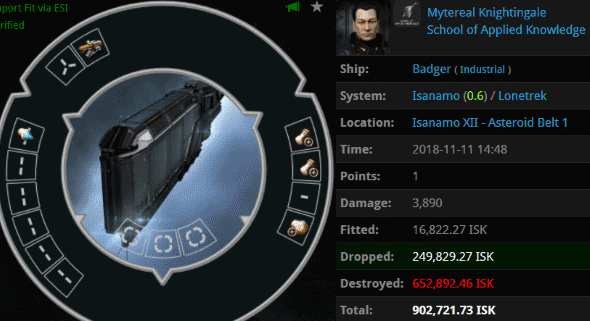 alliance has destroyed over 275,000 ships. Sometimes I wonder if we're ever going to gank this "wrong person". What's wrong with our site? Word to the wise: A mining permit is less expensive than a divorce. That's the correct attitude. The rest of that mail showed restraint and humor, there may be hope for that dude. Had a blast last night taking out the trash in Dantan. Good to see all tanked skiffs and procs are back as the ship of choice. @shelly tortuga, it has been so long, i was literally embarrassed for you failing to stop any miners from exploding with your cloaking falcon. all of your mentees must be cringing. Say a little prayer to Kalynn Shardani next time you try to ag me. Seems like the Goofuses had a hard week. Will they ever learn?